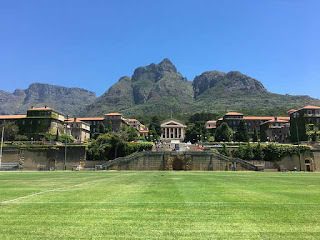 The above image is of the stunning University of Cape Town, where my late grandfather was the first full-time dean of engineering and where I studied occupational therapy. The occupational therapy department was part of the medical faculty and hence we were located on a different campus right next to the main teaching hospital. However, we did get to have lectures on this main campus during first and second year and visiting the main library was always wonderful. Aside from sharing the beautiful setting where the university I attended is located, there is another purpose to this post. Over a month ago, I sent a copy of my book, "Healing Your Life Through Activity" to the first head of the university occupational therapy department, Miss S.W. Mountford. I hope that she will write a letter to go into the book. - The cover she praised very highly. When I mentioned that my husband had designed the cover her response was that it is brilliant. Phew, 2 good comments, but she has not yet opened the book. Yes, she has taken a brief look. She said she has some commitments with the holiday season but was very much looking forward to getting into reading the book from cover to cover. As for her initial impression of the content, so far she says it is compelling reading. Well now I sit and wait on tenterhooks to hear what her impression will be after reading the book in detail. I do hope that it is still as favourable as the initial impression has been. Have you obtained your copy of "Healing Your Life Through Activity - An Occupational Therapist's Story"? If you have, do be in touch and let me know how you found it. If you purchased it online please do leave a review as this helps other potential readers to find the book too. The book is available on the CreateSpace eStore, on Amazon in US, UK, Canada and has just come up on Barnes and Nobles and Book Depository too. So it's easy to obtain for those who shop online.